Junior does are those who have never freshened (kidded). 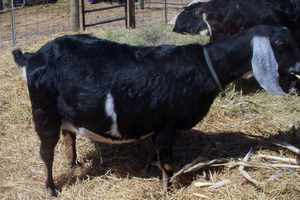 We breed for long lactations and long lived animals, so we normally allow our does to freshen at about two years of age. 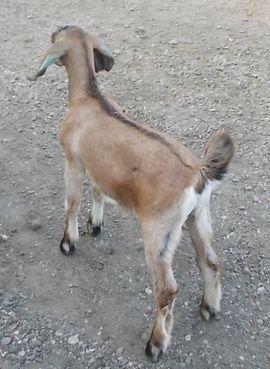 To ensure maximum growth, we feed doelings and bucklings fresh goat's milk until they are six months old. Wethers may get weaned slightly earlier, but we believe the extra nutrition from milk gets our kids off to the best start. At peak, they will drink three or more quarts of milk a day. Kids also have access to limited grain, alfalfa, grazing and plenty of other treats such as pumpkin, leaves, strawberries and any extra garden produce or plants - including weeds. With our normally severe winters, I prefer to have my herd going into winter in really good condition. It can be hard to add condition when it's cold AND they're milking or growing. However, this can result in lower LA scores, especially for young stock. Dance came to live with us shortly after her birth and immediately fit right into the family. She's a quiet young lady who loves to stand on her hind legs and dance. She's got gorgeous dairy strength, strong feet and legs with nice body capacity and a beautiful head. 2018 Lactation: Still in progress, but Dance has earned her milk star. 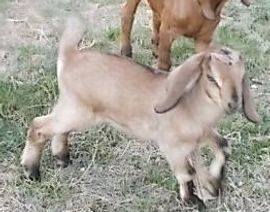 April 25, 2019 - Dance is due to deliver kids sired by Paco. All doelings are reserved. March 25, 2018 - Dance delivered twins sired by Paco. There's a lovely black doeling and a brown buckling. Dance is wonderful to milk. August, 2018 - Dance was named Grand Champion Dairy Doe at the Oliver County Fair. Dance is well-named. She's constantly in motion. These photos show her at just two weeks of age. Here she is pictured just days before kidding in April, 2018. Divy was the last kid born in our herd in 2017 and what a way to end the season! She was so large and strong right at the beginning that we were convinced she was a buck. Imagine our delight when we checked! Divy came out with self-assurance that she would be the center of attention - just like her mother Millie. 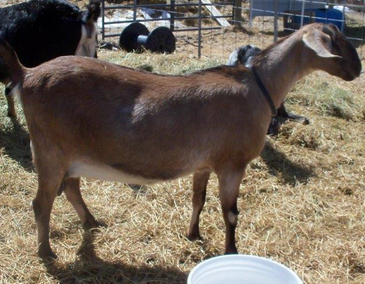 She has a gorgeous, wide body and stance, extremely strong, correct legs and ears that are the envy of all. I'd like her to have a stronger Roman profile, but that's minor to us. I can't wait to milk her in 2018. 2018 Lactation: Still in progress. Divy easily earned her milk star. 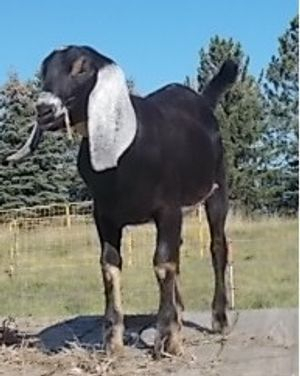 April 17, 2019 - Divy is due to deliver Paco kids. By ultrasound she was confirmed to have at least twins; perhaps triplets. All doelings are reserved. April 19, 2018 - Divy delivered triplet Paco kids. 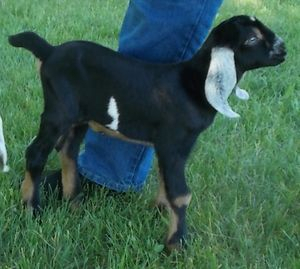 There's a black doeling and a brown and a black buckling. She's extremely easy to milk with large orifices and that glove-soft udder. Divy just three days old.